Vertiginous limestone islets and karsts provide an incomparable backdrop to Ha Long Bay. 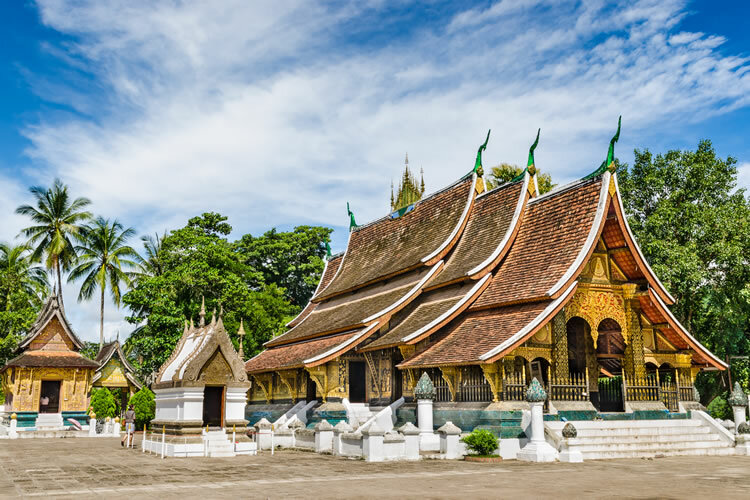 Venture into the unspoilt and verdant country of Laos, where there are few moments you’ll value more than the opportunity to take part in a traditional morning alms ceremony along the streets of Luang Prabang. Once in Cambodia, you’ll marvel at the ingenuity of Tonlé Sap’s floating villages one day and the incredible Khmer structures at Angkor Wat the next. Fly from a choice of UK airports on selected airlines, including Emirates via Dubai, from London Heathrow, Birmingham, Glasgow, Manchester or Newcastle. Alternatively, fly with Singapore Airlines via Singapore from London Heathrow or Manchester. Welcome to vibrant Vietnam. Settle into your iconic hotel for your two-night Special Stay. Visit the History Museum and Hoa Lo Prison, or buy ingredients for a cooking class. Alternatively visit Ho Chi Minh Quarter and the Temple of Literature. Later, discover the Old Quarter back streets on a cyclo ride. After attending Hanoi’s famous water puppets show, learn the secrets behind this illusionary piece of theatre thanks to your special backstage pass. Board the elegant Au Co for an awe-inspiring genuine two night cruise through the picturesque waters of Halong Bay. This morning awake with a Tai Chi lesson. Later, visit Cat Ba Island before cruising deeper into the National Park. Return to your hotel in Hanoi for another Special Stay and a historic bunker tour at the hotel. Enjoy a Vespa foodie tour of Hanoi’s old quarter by night, or La Terrace at Sofitel. Alternatively, sample Ly Club. Relax this morning before flying to Luang Prabang, Laos for a three night Special Stay. Bargain at the night markets. Participate in morning alms by donating food to the local monks. Visit the former Royal Palace, Wat Xieng Thong and Wat Mai before cruising to Pak Ou caves. Stop at Ban Xang Hay, a village specialising in traditional rice wine before partaking in the sport of Petanque with the locals. Journey to Kuang Si Waterfalls or discover different methods of weaving and dyeing textiles. Alternatively, discover Luang Prabang’s art scene and handicraft workshops. Immerse yourself in the Laos traditional Baci ceremony, where you will pay respects to ancient animist traditions. Watch the sun set from Mount Phousi. Fly to Siem Reap for your three-night Special Stay. Visit Ta Prohm temple before exploring at Angkor Thom and the multi-faced Bayon Temple. Later in the afternoon visit the colossal Angkor Wat. Take your Premium reserved seat at the colourful Cambodian Circus, Phare. Marvel at sunrise over the magnificent Angkor Wat before moving to a special location for a champagne breakfast with food prepared by a NGO supported local bakery school. Discover Banteay Srei and visit the Landmine Museum or admire the skills on display at Artisans D’Angkor. Alternatively, cruise on Tonle Sap (seasonal), take a tuk tuk to the markets, or a tethered balloon ride (weather dependent) above Angkor Wat before visiting a Pouk Silk Farm and Preah Khan Temple. Be wowed by a Scenic exclusive magical gala dinner at an Angkor temple, with included drinks and a show featuring Apsara dancers in front of candle lit temple ruins. Discover Cambodia’s rural countryside on your drive to Kampong Cham where Scenic Spirit awaits. Walk (or drive) to the top of Wat Hanchey, an ancient hilltop pagoda and monastery to meet the resident novice monks. Sail to Kampong Cham. Learn about the history of the area with a visit to Phnom Pros (Man Hill) and then Wat Nokor. Alternatively explore the ecotourism village of Cheung Kok or spend your time visiting a rubber plantation factory and betel nut village. On arrival in Angkor Ban, explore its historical wooden houses, which survived the Khmer Rouge, and visit the local pagoda to observe the lifestyle of resident monks. Receive a blessing from a monk and learn how to pray in a Buddhist pagoda before partaking in a ceremony, which contributes to the daily meal of the resident nuns and monks. Later sail downstream to Koh Dach, an island dedicated to the art of silk weaving before continuing your cruise to Phnom Penh. Enjoy a cocktail reception on the sundeck against the backdrop of Phnom Penh’s lights as the ship sails towards the capital at sunset. Upon arrival revel in our exclusive Phnom Penh by City Lights tour, giving an insight into the capital’s nightlife. Journey to the Killing Fields and tour Tuol Sleng, or join a hands-on Khmer cooking demonstration. Alternatively, explore by Tuk Tuk Phnom Penh’s colonial buildings and Central Market. Immerse yourself in the historically celebrated luxury of Raffles, Hotel Le Royal. Enjoy a guided history tour followed by a high tea prepared in front of you, all whilst sipping on the hotel’s signature cocktail. Choose to retire to the Elephant Bar for happy hour before returning to the ship. Marvel at the Royal Palace, with the famous Silver Pagoda within, on your included visit to this must-see attraction. 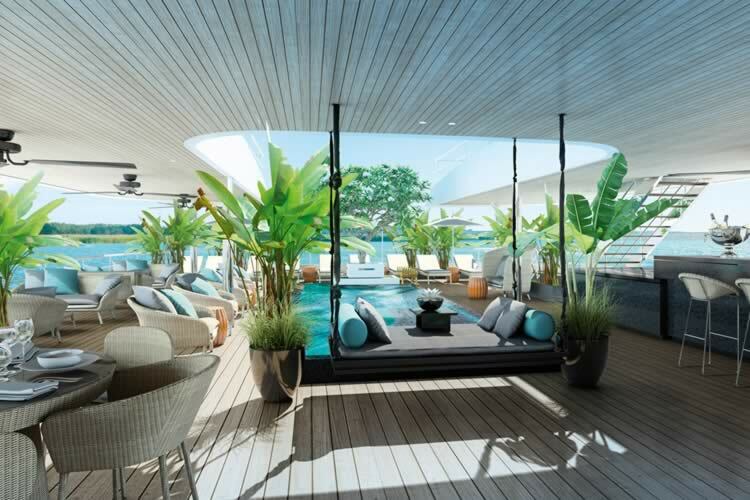 The afternoon is at your leisure to take advantage of the facilities of the most luxurious ship on the Mekong as you set sail for the border. Celebrate arriving in Vietnam with your themed evening dinner. Visit the farmers on Evergreen Island and enjoy a ride in a Xe Loi or cruise by speedboat to Chau Doc and walk through the market, visit a family-operated fish farm and cruise around Chau Doc waterfront. Alternatively visit Tra Su Bird Sanctuary. Whilst sailing to Sa Dec take the time to sip a cocktail by the pool or enjoy your private balcony. Visit historic town of Sa Dec and explore its lively market. Stop for tea at the home of Mr Huynh Thuy Le who inspired Marguerite Duras’ novel L’Amant. Visit Cai Be before stopping at local cottage industries and a traditional house in the area. Alternatively savour afternoon tea at a French colonial house or choose to stay on board and learn to make cocktails. Drive to Ho Chi Minh City and enjoy an orientation tour around your hotel for the next two nights. Spend the remainder of the afternoon at leisure. Enjoy a Vespa foodie tour of Saigon by night, enjoy a meal in the surroundings of an old French colonial house or a restaurant specialising in street food. Alternatively, dine at your hotel’s restaurants – Yu Chu, Basilico or Market 39. Travel to the Cu Chi Tunnels and learn about the underground labyrinth of war-time passageways. Visit the Reunification Palace and War Museum before attending tonight’s farewell dinner. Depart and transfer to the airport for your flight home with your chosen airline. Alternatively, extend your journey with an inbound stopover in Dubai, Bangkok or Singapore. Save a guaranteed £200 per person and upgrade to Business Class flights for only £99 per person! 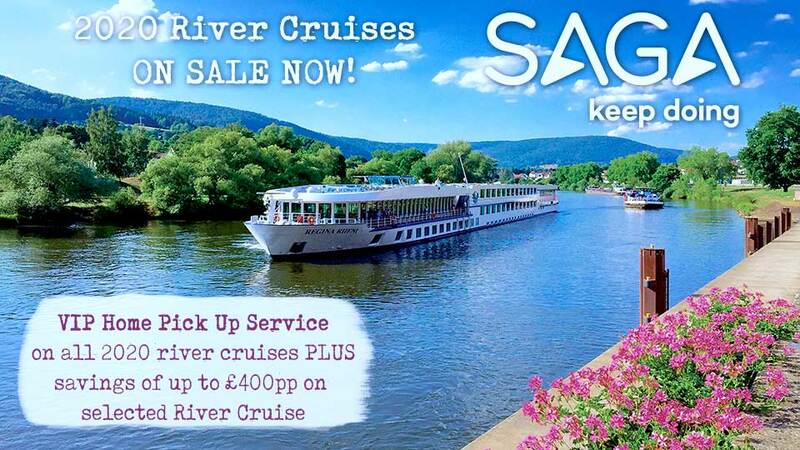 Book with RiverCrusing.co.uk today! Our clients rate our service at over 99%! Terms and conditions apply. All offers are subject to availability and operators booking conditions. Prices are based on two passengers sharing the lead in grade stateroom unless otherwise stated. All discounts have been applied to fares displayed. ^Offer valid for new bookings only made before 11 June 2019. ^Private door-to-door chauffeur transfers are complimentary within 75 miles of an airport where flights are available from, UK mainland only. For guests who live outside of 75 miles, an additional supplement of £2.00 per mile will be charged. We charge a one-off small £20 booking fee. That’s it - nothing more and no add ons when you pay the balance. E&OE. ABTA P6710. 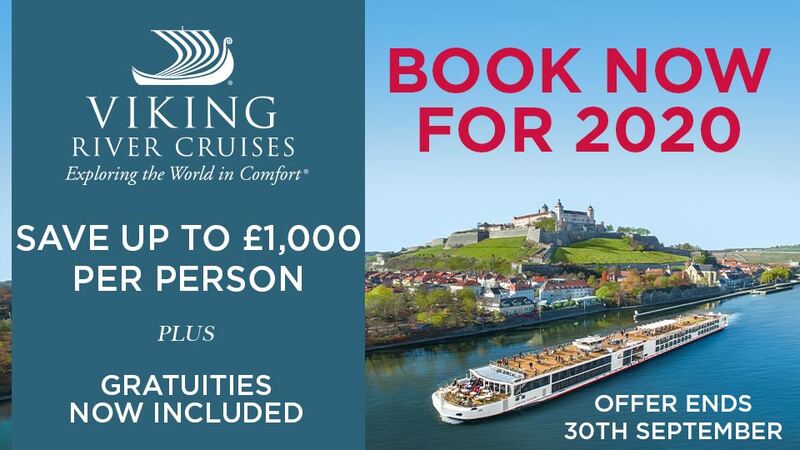 River Cruising is brought to you by the team at the award-winning Travel Village Group - a family-run travel agency established for over 60 years! Our river cruise experts are here to help you every step of the way! Call today on 0800 810 8220. 298 Highfield Road, Blackpool, Lancashire, FY4 3JU, United Kingdom.